My friend and I definitely knew better, but we decided to watch this anyway, just out of sheer curiosity. Hindsight, of course, is always 20/20. Believe the bad things you hear about this one. 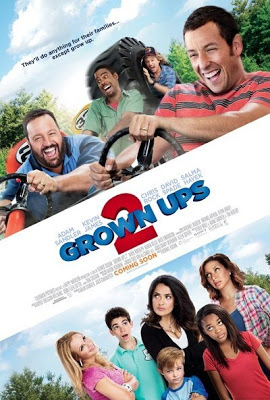 Grown Ups 2 was more gross than it was funny. I have heard opinions that the funniest people in this movie were Taylor Lautner and his character’s band of fellow Greek brothers. Of course, hearing that before I went in to see this, I was hoping to at the very least get a laugh from him, but even that expectation proved to be too high as I didn’t find anything particularly amusing about anything he or his “brothers” did. The surprise for me here was actually Alexander Ludwig’s character. For those of you who have watched The Hunger Games (2012), you will probably recognize him as Cato. I did like him there, and I liked him here as well as David Spade’s estranged son. Terrible hairdo aside, I personally think Ludwig’s character was probably the only redeeming thing about this whole movie and made it a little less of a pain to watch. In fact, I actually see something of potential for this actor, and I’d be curious to see if he gets picked up for more prominent roles in the future and I am interested in seeing how he does; hopefully well. I’m used to closing my eyes in movies when things get too violent and gory for my liking, but this was one of those times I was constantly covering them because some of the scenes were just so gross. Like one actor eating (I think it was Cheetos?) that had been stuck up his nose. Yuck. Many of the jokes were ill-timed or not funny at all. For the jokes that had the potential to be funny, because they weren’t said at the right moment, there always seemed to be this awkward lingering silence right after the supposed punchlines. Now I don’t remember the first Grown Ups (2010) too well, but I feel like it was at least a little funnier than this. Maybe not. I’m almost afraid to watch it again just for the sake of refreshing my memory. Thanks for the like! And yeah! From what I can vaguely recall, I think I might have liked the first one too. I didn’t even know that one had a soundtrack! Hahaha. Thanks for stopping by, good to see you! If you like your Dad’s music then you should definitely listen to it 😉 Haha! HAHAHA. I’ll check it out. Thanks for the recommendation! Wow thanks for taking one for the team and checking this one out for the rest of us. HA HA HA! Oh I see. So your website title is unofficially 3 Guys (and a Lady ;p). You’re welcome, haha. I personally feel that Adam Sandler was NEVER funny; he tends to wind up in gross movies like Jack and Jill, so I tend to avoid. What you wrote sounds like exactly what I would’ve expected from a movie called Grown Ups 2 featuring Adam Sandler. Hahahaha. I didn’t think he was bad from what I remember of Mr. Deeds and Anger Management, but it’s been a while, and I was young when they came out and I watched them. Perhaps I’ll have a different opinion now.